US Secretary of State John Kerry today urged Iran to come up with new nuclear proposals, rebuffing Tehran's position that the onus is now on foreign powers to unblock the long-running impasse. Two police officers were killed and 11 others injured when a van carrying policemen assigned to protect polio vaccinators was targeted with an IED near a hospital in the Budh Bher area of Peshawar on Monday, the Express News reported. India today sought meaningful devolution of power by Sri Lanka and early resumption of dialogue to facilitate "genuine reconciliation" in Tamil-inhabited areas of the country. On his first visit here, External Affairs Minister Salman Khurshid raised the issue of reconciliation during his meeting with his Sri Lankan counterpart GL Peiris at the Ministry of External Affairs. Afghanistan's president says disagreements over issues such as sovereignty are still impeding a security deal with the United States. President Hamid Karzai says he will convene a council of Afghan elders, a Loya Jirga, in a month's time to discuss the state of the agreement. 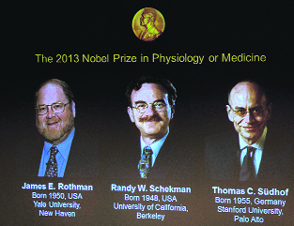 US duo James Rothman and Randy Schekman and German-born Thomas Suedhof won the Nobel Medicine Prize today for their groundbreaking work on how the cell organises its transport system, the jury said. The trio, who all work at US universities, were honoured for "their discoveries of machinery regulating vesicle traffic, a major transport system in our cells," it said. US Secretary of State John Kerry today said Libyan authorities were not informed of the counter-terrorism operation carried out by US troops in Libya to capture Al-Qaida leader Anas al Libi. Malala Yousafzai, the Pakistani teenager who is a front-runner for the Nobel Peace Prize after surviving a Taliban assassination attempt last year, has said dialogue with militants is the only way forward for peace. “ The best way to solve problems and to fight against war is through dialogue,” the 16-year-old said. Iran's Foreign Minister Mohammad Javad Zarif said yesterday that the previous foreign offer, made by the “P5+1” group at two meetings in the Kazakh capital of Almaty before the June election of moderate President Hassan Rouhani, was no longer valid. But Kerry, while welcoming recent overtures, including a historic contact between Rouhani and US President Barack Obama, said the ball remained in Iran’s court. “The group of six put a proposal on the table at Almaty and I don't believe as of yet Iran has fully responded to that particular proposal. So I think we are waiting for the fullness of the Iranian difference in their approach now,” he told reporters in Indonesia after meeting Russian Foreign Minister Sergei Lavrov. Western powers and Israel have long accused Iran of seeking to develop nuclear bombs in the guise of a civilian programme, charges Tehran has always vehemently denied the proposals made in Almaty required Iran to suspend uranium enrichment at the 20 percent level it says it needs for a medical research reactor, and to halt enrichment at its underground plant at Fordo near the central city of Qom. EU foreign policy chief Catherine Ashton, who represents the six powers in the talks, said last month that she was still waiting for Iran's response to those previous proposals. But Zarif said that Rouhani's election had changed the dynamics. “The previous offer by the P5+1 is history and they should come to the negotiating table with a new approach,” the ISNA news agency quoted him as saying yesterday, while renewing his insistence that a deal could be reached to address the concerns of both sides. The improvised explosive device (IED) was planted outside a basic health unit in the Badabher area where vaccination materials were being distributed to volunteers. Around 12 police officers were in the van at the time of the blast. A policeman and a volunteer of a pro-government peace committee were killed by the powerful blast. Eleven civilians sustained injuries in the incident, the latest in a string of attacks on volunteers engaged in Pakistan's polio eradication programme. "The explosion caused by an IED targeted policemen," said SSP (Operations) Najeebur Rehman. The van was carrying policemen who had been tasked to protect teams going out to vaccinate children in the area. A police spokesman described as incorrect earlier reports that seven persons, including several policemen, were killed in the attack. Several policemen and civilians, who lost consciousness due to the impact of the blast, were wrongly declared dead, he said. Rehman said the bomb went off just as the police van reached the health facility to provide security to polio teams. The polio vaccinators were unhurt as they were inside the health facility, officials said. The injured were taken to Lady Reading Hospital. Two Taliban factions have banned vaccinations in the lawless North and South Waziristan tribal regions. They claimed health workers were spies for the US. India today sought meaningful devolution of power by Sri Lanka and early resumption of dialogue to facilitate "genuine reconciliation" in Tamil-inhabited areas of the country. On his first visit here, External Affairs Minister Salman Khurshid raised the issue of reconciliation during his meeting with his Sri Lankan counterpart GL Peiris at the Ministry of External Affairs. During a joint news conference with Peiris, he called for “meaningful devolution” of power to provinces, including Tamil-inhabited areas in the north. “India has been consistent in calling for an early political settlement and national reconciliation through meaningful devolution of powers, so to ensure that all citizens of Sri Lanka, including the Sri Lankan Tamil community, would lead a life marked by equality, justice, dignity and self-respect," Khurshid said. Afghanistan's president says disagreements over issues such as sovereignty are still impeding a security deal with the United States. President Hamid Karzai says he will convene a council of Afghan elders, a Loya Jirga, in a month's time to discuss the state of the agreement. It is doubtful a deal will be complete by that time. US duo James Rothman and Randy Schekman and German-born Thomas Suedhof won the Nobel Medicine Prize today for their groundbreaking work on how the cell organises its transport system, the jury said. The trio, who all work at US universities, were honoured for "their discoveries of machinery regulating vesicle traffic, a major transport system in our cells," it said. Their discoveries have had a major impact on understanding how cargo is delivered within and outside the cell and have implications for work on several diseases including neurological and immunological disorders, as well as diabetes, the Nobel committee said. Each cell is a factory that produces and exports molecules. "For instance, insulin is manufactured and released into the blood and chemical signals called neurotransmitters are sent from one nerve cell to another. These molecules are transported around the cell in small packages called vesicles," it explained. The three Nobel laureates "have discovered the molecular principles that govern how this cargo is delivered to the right place at the right time in the cell," it said.